The frequency of 3+ "recommended options" is too high. It makes you wonder if there is a UX angle to this. Why not 1 or 5? Or maybe custom solution? 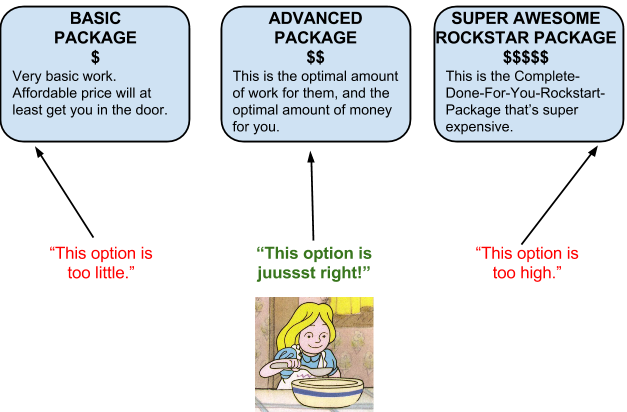 The Three-tier Pricing Strategy always works because often customers don't know what they need. So in one simple chart, you show them what they can get for different prices. They feel like they have a choice and do not feel like they are being swindled. You want to do business by making the majority of them choose the intermediate one. If a customer is deciding whether to choose your product or not, and there is a single option available, then the choice is binary. They can choose to buy it or not. If you present 3 choices, then they tend to forget about the implicit option to not buy the product. When 3 options are presented, people tend to choose the middle one. This effect is known as the centre stage effect. My expertise is in motivation theory and educational psychology, so I'll offer my 2 cents up from that perspective then on to the big picture. Scenario 1: Do it or else. You give a kid the choice between doing an assigned activity or chore and the alternative of a consequence for not doing it. This method is generally considered 'confrontational' by teachers since it sets up a possible divergence of goals between the adults and kids. It also suffers from the classic mistake of adults consciously offering a choice (don't do it should never be offered as a choice!) that is not a desired outcome. Scenario 2: Choose your favorite. You give a kid the choice of two different activities. Both are activities the adults would value as appropriate outcomes. Kids feel empowered by the ability to choose their favorite and are happy to cooperate. Whichever outcome the student chooses will leave the adults and kids with their goals aligned, namely that we want kids to be successful in appropriate activities. You do not have to convince, coerce, or confront. What about those online sales strategies? Curated choices: As applied in a sales scenario, you should never give the prospective mark, er .. customer, the choice of not doing business with you. That is a foolish choice to offer your customers. They know they have that choice. They can walk out of the store or click off of the website anytime, but the salesperson should not be the one 'offering' that choice. Anyone who ever watched "Miracle on 34th Street" will recall the horror of the Macy's sales executives when they learned that their Santa was sending customers to Gimbel's! Allow people to be themselves while they give you money. Certainly it is important to do business honestly and offer a valuable service at a market price, but there is more to it. People are not machines. They don't sit around ruthlessly calculating the best deal. They want to be impressed. They want to be sold to! Instead of yes/no choices, you offer choices that inspire customers to go towards their natural tendencies, whether it is thrift, seeking the gold-plated doodad, or ruthless efficiency. 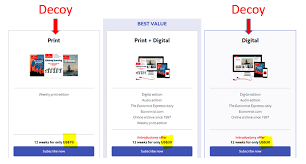 Offering discounts on yearly subscriptions is an example of appealing to efficient people. Not coincidentally, those are the more 'logical thinkers,' the same people who are less influenced by the "ooh, pretty!" (luxury-seeking) and "dam, that's cheap!" (thrift) options. Careful, however, with the number of choices, since too many choices makes decisions noticeably more difficult and will drive away customers who get confused and do not see a clear path to their favorite deal. Leave nothing to chance. The more you plan, the more YOU PLAN ... instead of somebody else! Nobody will care for your business as much as you, so do as much of the thinking and planning as possible. You will often see that one choice is setup as the default choice. The times you don't notice it, I suspect it is there anyway and I would look closer. Not having a choice or path preselected is almost as bad as offering the choice of yes/no. So you lead them down the path where they can relax (effortless and entertaining, please) and look around for their preferred options. Generally, you want people to take it easy and make emotional decisions. The more people are asked to think, the more they will choose something you would prefer them to avoid. This is the reason so much of our advertising is mind-numbingly stupid. If you lead them right, on a pleasant path, and have the right options, people who are in the market for your service will subscribe at a much higher rate. As already noted in some comments, the three-tier product range design has both psychological and economic reasons. I would like to explain the economics a little more. Imagine you want to offer a service with only one tier. How do you price it? Your market research shows that you will have two groups of customers: professionals who would use the service daily, and casuals who only use it a few times per month. How would these two groups value the service? Obviously the casuals would value it lowly, while the professionals would be willing to pay rather high price. If you charge the professional's price, then you would not acquire the casuals as customers because you are too expensive for them. And if you charge the casual's price, then you don't make as much profit as possible. Perhaps you might not even appeal to them since you are too cheap. Charging everyone a middle price is merely compromise - you will still not acquire the bottom of the casual market, and you could still get more money from the professionals. 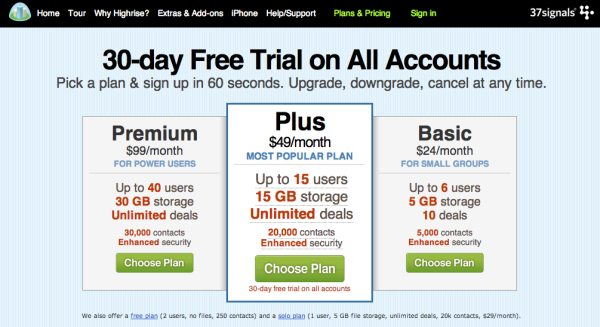 The obvious solution: create two tiers, so you can charge customers from each group as much as they are willing to pay. 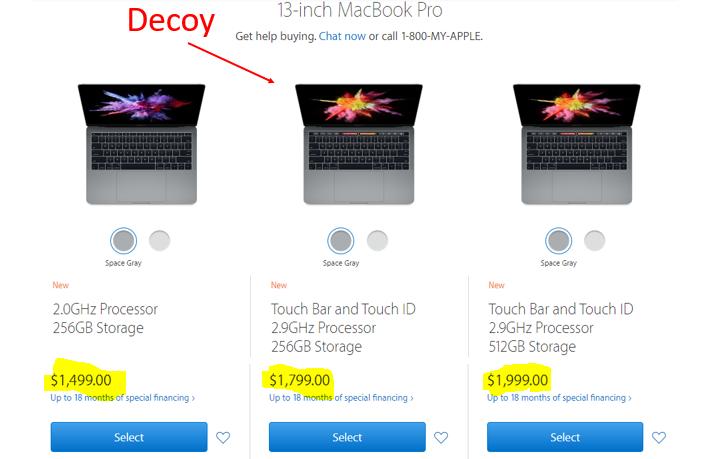 But you can't simply charge two prices for exactly the same thing. So you must create two versions of your service: either takes some features away from the casuals that they don't need, or add some extras for the professionals. In similar situations, the market might have more than two user categories. We also get back to the psychological aspect: binary choices can be difficult. So you create three tiers. For a more elaborate explanation, I recommend the book "Information Rules" by Carl Shapiro and Hal Varian. The book also says that too many tiers will overwhelm customers (looking at you, Ubisoft) and that the best number of tiers, if you don't know better, is probably three. Its all different manifestations of cognitive bias. Every human is effected by cognitive bias, thereby it is a factor in all human transactions. Which is definitely fundamental to sales/marketing because you are selling and marketing to humans. This is a step in an overall transaction in which cognitive bias is used to influence a human to seek out an interaction with an interface to facilitate and resolve the transaction. Human interfaces, web or otherwise are designed to facilitate a real world transaction. Every interface is intentional, it is a vital step in facilitating and resolving the transaction. This is why the science behind successful IA/UI/UX designs is largely based in cognitive bias. The decisions you make in designing a human interface are founded in leveraging human cognitive bias (hopefully to the benefit the of user) to increase the success rate of resolving the transaction. This is an example of the decoy effect, as mentioned by others already. One always wonder why there is always three choices, as it is used to sway the potential buyer into either directions of the attributes (e.g. cost, features), by catering to the user attributes. Take a look of this link on the example, and some famous use of decoy effect by many companies that we need come to contact with. Unfortunately this comes down to working memory, and frustration. The human brain can handle 5 plus/minus 2 items on average. If your feeling pretty stressed out, didn't get a lot of sleep, are ill, are distracted by something at home, or otherwise off your game - then you've probably only got 3 slots of available focus. On another day, you are well rested, you've being practicing various focus techniques, you are not distracted with various emotional concerns, you are healthy and have no unmet needs. You probably have 7 slots available to use. Note: these slots are highly variable, some people will have three slots when they are interacting with someone new, but 7 slots when reading a science article. Or it could be the other way around. But generally 3-7 is a good heuristic. pick the plan big enough for your own usage, but only just so. (which is why they are ordered so that you can scan across a table to find the next largest, and why the top tier is usually unlimited). pick a plan at random because, something is better than nothing. (and those prices are all acceptable). Now that something has been selected, two slots become free and the person can query it, and make sure its not obviously wrong. It might not be best for them, but at least its not bad for them. If they are rushed though they may not spend those slots on questioning their decision, and just move onto one of their other issues. In this case the person is trusting those cognitive biases to get by. But if you've got more spots available you can ask more advanced questions. Also by definition this also means your not distracted, pressured or otherwise rushed. Three in this case is just large enough that you can use 2-4 slots for getting in depth about a topic, but still have all those options in mind. Remember that a user who drops an option to follow a query is going to be frustrated because they "forgot" x. The more frustrated a person becomes the more they are going to drop, because now slots are being used by emotional issues. When a person drops too many items too quickly the brain considers itself in a state of emergency and literally runs from the issue. Ever found yourself avoiding something because its "hard". This is particularly difficult with hard issues, like selecting a phone, or internet provider because most people haven't been taught how to do it. The internet really isn't that old. Mobile phones came on even later. Now again its about the size of working memory, its 3-7 roughly 5 which means to be 50% confident that you've seen a good sample of what exists, you will have seen 3-4 different offerings. If you've been told that those 3-4 offerings represent the least, the average, and the most then you've actually sampled the entire space. Which gives you confidence that you're not dropping anything. Thus it actually avoids frustration from feeling like something has been missed to. It is no wonder with both sets of forces that most decision are reduced down toward 3. Even in other areas like a ribbon bar. You'll notice the best ribbons have three big sections, then three smaller sections, etc, until a choice is completely made. Also notice that menus that starting going further than 3 deep start to feel clunky/wrong. Its because your now pushing ideas out of working memory. I'm going to suggest it's something less strategically motivated. This to me just looks like an extension of the "Small, regular or large?" question you get when you ask for a Coke or fries at a fast food restaurant. This suits every average person and is what you'd expect at a walk-in - whether real or virtual - store. I'm not suggesting the centre-stage, illusion/paradox of choice and decoy strategies others mention aren't in play in some circumstances, but Occam's suggests its not always the case. I may be wrong but in the provided example I'd expect the first two options to have take-up. Sole proprietors/soho users would like the basic option; think invoices/flyers and a bit of storage. 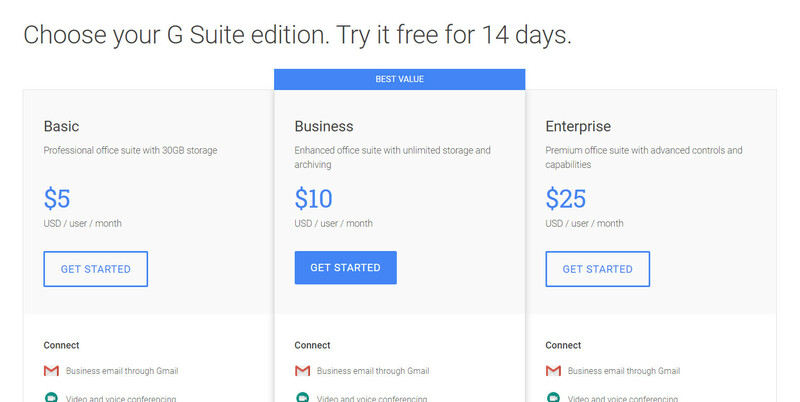 SMEs would go for the one in the middle; price isn't crippling and infinite storage/archive. That last one is looking a bit decoy-ish. Not the answer you're looking for? Browse other questions tagged e-commerce pricing many-options or ask your own question.